CARLSBAD–Guests can now take a splash in the ocean without ever getting wet and become a shark explorer at Sea Life aquarium’s two newest exhibits: Sea at Night and Shark Mission. Open just in time for spring break, both exhibits allow guests to learn about marine life in a fun and interactive way. 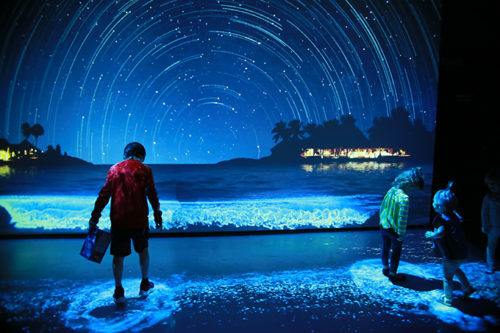 Sea at Night invites guests to jump, leap and “splash” into simulated bioluminescent waves that react to their footsteps. The reaction created by the guests’ movements demonstrates the effect of a glowing tide similar to ones often seen along the Pacific coastline. Shark Mission allows kids to come face to fin with six different species of sharks and rays on three giant touch screens. Young explorers can learn about anatomy, conservation and other cool facts through interactive activities and games. Guests can also hold a shark’s tooth, learn about shark skin and eggs, plus step into a shark cage. Sea at Night and Shark Mission are open now for guests to explore at Sea Life aquarium. For more information, visit legoland.com/California.